In Part 3 of this series, we continued our look at how miniature golf has been positively impacting people's relationship with their local libraries and helping to raise funds to keep them in order. For this part, we highlight even more events that have been held around the United States, including one we got to visit recently. From everything we've seen for these events they seem to continue to be a good draw for the local communities, at least for the first couple of years. It will be interesting to see if events at the same location can continue to raise funds with these events year after year. The first event we're highlighting is trying to do just that. The event at Trumbull Library in Trumbull, Connecticut, USA is now in it's fifth year and they are looking to keep up their average of 400 people a year. One of the strategies is to continue to add special prizes or challenges to the event such as the hole-in-one contest they added this year. While we don't have the final tally, a visitor to The Putting Penguin had a short review seeming to enjoy it and note that it was crowded. The next event we look at wasn't specifically for raising money but was more focused on bringing people into the library. This one also combined some education aspects as it was held at Castleton University in Vermont, USA. The course was put up over their homecoming weekend and was designed to not only show off the library to families and alumni but also to entice more students to check out what the library may have beyond the traditional "place to study." Based on the article it looks like their event was a success and the picture shows the great way some of these events incorporate multiple levels of a building such a library. The third event was a big bang event as all the proceeds are going towards not just improving a library, but building a new one! The event was held at Reuben Hoar Library in Massachusetts, USA. Over 450 people attended the event over the two days and combined with a silent auction and sponsorships from local businesses they raised over $15,000 (~12,560 EUR). While that may not be enough to build much of the new library it's an impressive add to the fund for a minigolf event. We also wanted to highlight some small articles that talked about successes across the country such as Oak Bluffs Library (always nice to have more minigolf opportunities when you are on an island in Massachusetss), Vashon Library (another island adding a place to do some putting), and finally Needham (Massachusetts) where minigolf was played at Needham Free Public Library and was played on a course that was a revival of a college party idea. Finally, The Putting Penguin visited a local library minigolf in March, at the Wood Memorial Library in Connecticut, USA. 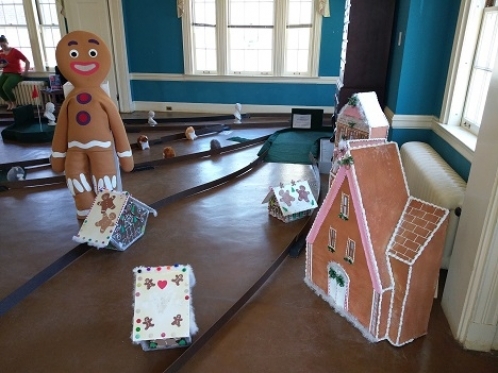 It was another course developed by the Library Mini Golf company and wound its way through the historic library incorporating both local businesses and the history of the area. In a testament to how popular this pastime is becoming, this was at least the sixth library course in Connecticut (a relatively small state) in the past 12 months. You can see The Putting Penguin's review here and a quick video of the signature "down the stairs ace" here. Know about a local library hosting a minigolf event? Give us a shout at patsheridan@minigolfnews.com!